Die Cut / Custom Cut Decals are a custom shapes with a vector cut around object that is not – Square, Circle, Oval, Triangle or Rectangle. There will be a 15% setup fee added to the total price. As seen in the image to the left is representing a 2″x2″ Square with a vector cut around the object. Using the formula below the image 2×2=4. 4 is the square inches area of the Decal. Go to the “Square inch” drop down and choose the best area in square inches that meets your needs. Then choose you “Order Qty” in that drop down for quantity pricing. 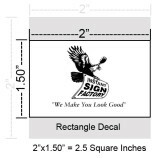 Pricing for decals is determined by the square inch. 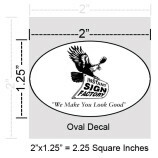 As seen in the image to the left is representing a 2″x2″ Oval decal. 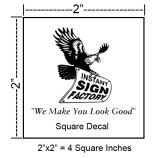 As seen in the image to the left is representing a 2″x2″ Rectangle decal. 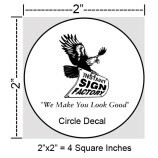 As seen in the image to the left is representing a 2″x2″ Round decal. 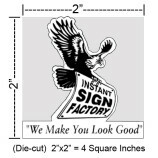 As seen in the image to the left is representing a 2″x2″ square decal. 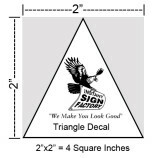 As seen in the image to the left is representing a 2″x2″ Triangle decal.